The last episode before the break ended with quite the shock: Isobel showing up unexpectedly at the Gilbert home. “Know Thy Enemy” picks up right there, with Isobel immediately rubbing everyone the wrong way and spilling to Jenna about her being both Elena’s mother and Alaric’s wife. Can you say awkward? Poor Jenna can’t handle this information download—and if she can’t handle this, finding out what’s really going on someday is going to melt her brain right out of her ears—so she takes off and disappears for the rest of the episode. There’s no time to dwell on Jenna’s pain, though, because Isobel is here and she’s ready to play. Mind you, for her, playing isn’t a simple game of hopscotch; it’s a veritable geometric minefield Pythagoras himself would have no formula with which to divine a simple answer. Here’s the general breakdown: John, Katherine and Isobel are working together to take down Klaus. 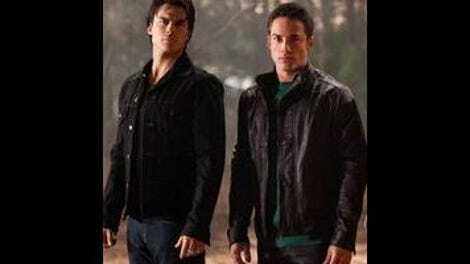 John, to protect Elena. Katherine, to be free of him forever. Isobel, because she likes Katherine, or mayhem, I’m not quite clear. Except things aren’t all as they seem, as Isobel and Katherine have a secret deal on the side to grab the moonstone and doppelganger Elena and bring them both to Klaus so he can break the sun and moon curse. (Side note: Does this mean we have to start liking John now? David Anders was working his hardest to make me like him tonight. STOP IT, ANDERS. LOATHING JOHN IS LIKE BREATHING.) On top of all this, Isobel ends up getting Alaric captured and then double crossing Katherine, all in the name of Klaus’ compulsion. Once Isobel’s mission is complete, she very tearfully tells Elena that the human version of her very much wanted to know her daughter someday and then immolates herself. Isobel is such a good mom, y’all. The whole fast-paced, ridiculously fun yet completely overcomplicated mess ends with Katherine waking up in a room where Klaus’ witch minion is performing a ritual… a ritual on Alaric so he can be Klaus’ vessel! For a show that crams four or five different plot twists in an episode, it’s amazing just how often these twists manage to be a surprise, and this was definitely a surprise. It looks like next week, Alaric is going to go all Olivia Dunham on us and be Klaus’ little meatpuppet, and I could not be more pleased. Well, unless Klaus kills Alaric. Then, my friends, I will be pissed. Very, very pissed. Also, this development leaves us with questions. Where is Klaus? Why does he need a meatpuppet at all? And what the heck does he want with Katherine, especially since he seems to not care so much about Elena right now? Klaus is an impressive character in that he’s only been talked about and never seen, and yet he is completely shaping the narrative of the show in a compelling way. Bravo, OG vampire. Bravo. In the midst of all this double-crossing madness, there was a quieter, much more emotional story happening, as Matt dealt with his newfound knowledge of Caroline’s vamp status. Caroline spends the hour looking for Matt, who has been agonizing over what happened to Vickie. She agrees to tell him everything she knows, and it seems he takes her up on her offer. The pure pain radiating from both characters (and actors) in this scene was pretty heartbreaking, even if you’re not invested in the relationship. In the end, Matt asks Caroline to make him forget everything. This would be wrenching enough, but the final twist of the knife comes when we learn that Matt actually went to Caroline’s with a sinister purpose and vervain-filled blood and was working with Caroline’s mother the whole time in order to get information. Really wonderful, nuanced work from both Zach Roerig and Marguerite MacIntyre there, as they mourn the loss of the person they love. This is a completely different Matt from the one we’ve seen before, and it has the potential to be fascinating. It also has the potential to be deadly for him, but that’s the thing about this show: You just never know! Finally, we have Bonnie and her quest to be the most powerful witch in all the land. She manages to use the Grimoire to harness all of the power of the town’s slain witches and now can do wicked cool things like affect the weather. Her goal is to take out Klaus, but there’s one tiny catch: In order to do so, she will have to use so much power it will likely kill her. Jeremy is adamant she not go through with it, but Bonnie is perfectly willing to sacrifice herself in order to save everyone else. She and Elena should get together and form a club or something. They could make t-shirts! As for Stefan and Damon, they realize Bonnie’s power is their secret weapon in the war against Klaus, and I don’t think anything (or anyone) could stop them from using it if it meant saving Elena. Overall, this was a really strong episode to begin the push towards the season finale. I’m not sure I can recall a show that’s so effectively built to the reveal of a “Big Bad” as The Vampire Diaries has done with Klaus. All I know is, I want Klaus, and I want him NOW. Alaric punching John right in the face? Yes, please. Damon, perhaps the decorative soap dish is not the best place to hide your important ritualistic artifacts. I guess he figured it was either that or at the bottom of a fish tank.